Green Towing San Diego is proud to announce that we have added a new tow truck to increase coverage over North County, San Diego; Call Us! There are several things to take into consideration when looking for the best towing company. You need to make sure that they’re honest, reliable, and provide you with a fair price. But, what is a “fair” price? What goes into the cost of towing and what can you expect? What goes into towing prices? The price of a towing will always vary, depending on a few factors. These factors include, the type of towing, which can range from a regular towing to a flatbed towing, the amount of miles the towing operator has to travel to transport your vehicle, and whether you are calling during the day or night. Some towing companies can charge a bit more for heavier vehicles, like pickup trucks and Hummers, and if the towing operator has to remove your vehicle from a ditch, which will take a longer duration of time to haul. Your insurance plays a significant role in saving you some money, as you can put a few miles on your insurance policy for free. You should always make sure to double check your policy in any case. Prices can also vary depending on the cost of living in each different region. If your car breaks down in the middle of nowhere, you’re generally going to have to shell out a bit more, since it’s going to take time for the towing operator to properly locate you. The most common factor for determining the price of a towing, always depends on the mileage. This is true, no matter which city or state you’re in. It always pays to do some extra research into the towing company before hiring them. You can ask your friends or relatives for a recommendation, as they’ve most likely needed a towing at some point as well. You should also make sure that the towing company is fully licensed and accredited by the Tow & Recovery Association of America. You can check with the BBB to find out if the company has received any prior complaints against them, and if so, what were the reasons. A few extra steps goes a long way! 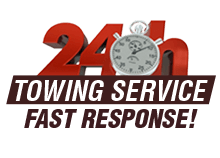 Why Choose Green Towing San Diego? At Green Towing San Diego, we offer competitive prices, and provide you with the highest quality services. We stay on call 24/7, and can handle any type of emergency situation. Our trucks are powerful, and capable of handling all types of vehicles, as we also use the best practices to safely secure your vehicle. All work is done on the spot, and our friendly roadside technicians will gladly provide you with company badge and ID, so you always know that it’s us. We’re also proud to show you our growing list of customer testimonials, as we’ve worked extra hard to achieve these elite results. Don’t trust an amateur company to do a professional’s job! Get in touch with us today, and let us help get you safely back on the road.